PROMOTERS, VENUES AND BANDS SEND US YOUR EVENTS. WE CAN’T ADD THEM IF DON’T KNOW IT’S GOING ON! we’ll try and update this page as often as possible but sometimes we’ll need a kick up the arse so feel free to do so! THE BIBLE CODE SUNDAYS as the most prolific band in the scene you’re never far from a BCS show! just click here for their latest up-to-date gig list. 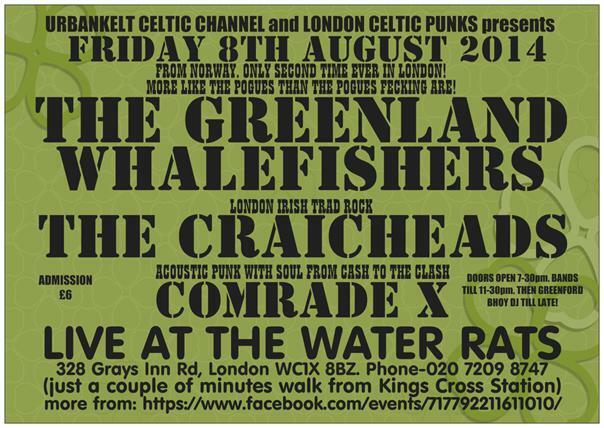 THE CRAICHEADS are another fantastic London Irish band who play regular gigs around town so look them up here to find out their next one! now they got a bit big I think we are suppose to call them Folk-Punk band but they will always be Celtic-Punk to us!!! After a successful London date their tour continues as BLACK WATER COUNTY head to Guildford to play The Star Inn venue. Support from The Lagan. Trad session at one of the best pubs in auld London town. From 6pm with Enda Mulloy (Biblecode Sundays) and Jim “The Lucky Plucker” Filgate (Clan Of Celts). All musicians welcome to come along and join in. Free Irish Stew on the day. Greenes Irish Pub, 362-364 Neasden Lane North, NW10 0BT. Facebook event here. THE MEN THEY COULDN’T HANG play Nells Jazz And Blues Club supported by psycho-ceilidh’ers NECK. Facebook event here. Tickets £20 here. 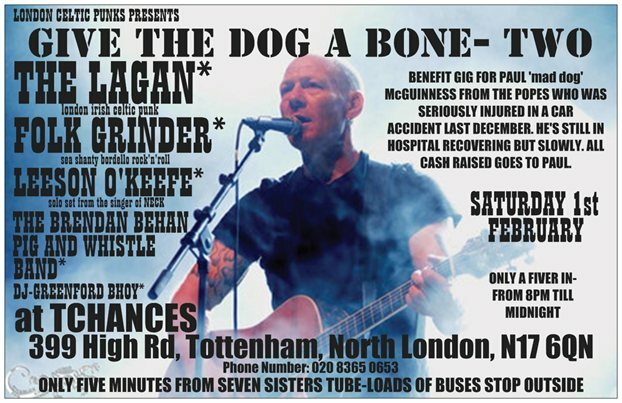 The venue is at 3 North End Crescent, London, W14 8TG and nearest tube -is West Kensington station only 3mins. The first dates of 2019 are for the kings of Celtic-Punk returning to these shores with a short but comprehensive tour taking in Brixton Academy again. Facebook event here. Sadly for MAN THE LIFEBOATS and GREENMAN RISING I don’t see many Celtic-Punk fans turning up for their gig at The Slaughtered Lamb in Clerkenwell but what an alternative to the Murphys gig! The sensational ASLAN, as part of their Charlie Moonhead Tour, will be playing their only London gig so be sure to get your tickets early. Early release tickets available at £20 + booking fee online or direct from the venue The Norbury, 1300 London Road, SW16 4DG. Venue and Tickets. THE UNDERTONES may be Feargal-less but can still kick out a tune or two. They play the Electric Ballroom in Camden town. Literally just a minutes walk from the tube station. With support from special guest the Neville Staple Band. Venue details here and Facebook event. Our first gig of the year and out of our safety zone with what promises to be a night to remember! Danny will be joined by another band making their London debut THE SILK ROAD from Chesterfield who bash out a superb bit of leftfield Celtic-Punk as well as COMRADE X giving us a set of Woody Guthrie meets The Clash folk-punk. 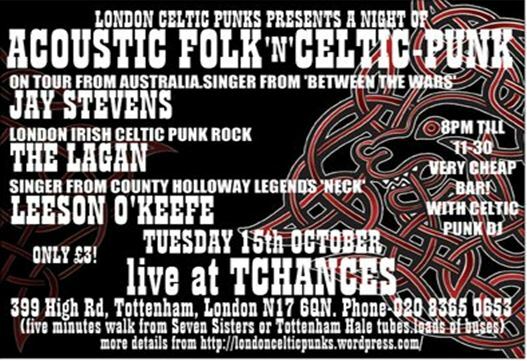 The London Celtic Punks resident DJ Greenford Bhoy will be forsaking his usual set of Celtic-Punk and Irish Folk for a set comprising totally of Gaelic Rebel Hip-Hop before, inbetween and after the bands! All at The Beehive, 104 Empson Street, Bow, London E3 3LT. Only 5 minutes walk (or a third of a mile according to Google maps) from Bromley-By-Bow tube station. Admission a straight fiver in advance. Live music begins around 8pm till approx. 11-30pm and DJ till 12-30am. Check back for ticket link shortly. Maybe more bands to be confirmed so join the event here and keep up to date with all the news as it comes in. It promises to be a real night to remember! London Gaelic Athletic Association biggest game of the season as they take on Galway in the Connacht Senior Football Championship Quarter Final clash at McGovern Park, West End Road, HA4 6QX. More details here. 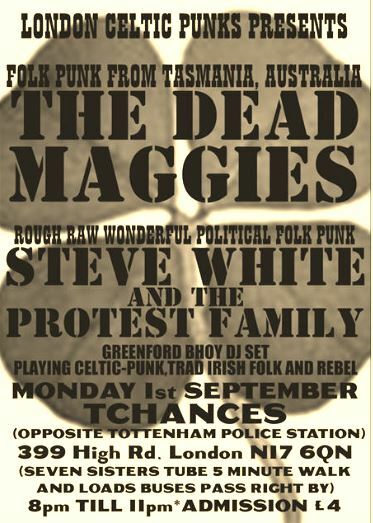 Stevenage Celtic Supporters Club are putting on the infamous and bloody brilliant Celtic band CHARLIE AND THE BHOYS at their home venue Club 85. A Glasgow Celtic-themed Irish folk band from Scotland. They formed the band in the 1980s in Barlanark in the East End of Glasgow and have played the famous Glasgow Barrowland Ballroom 28 times. Ticket details here. The show finishes well in time for the last trains North and South to Cambridge/Peterborough and London and the venue is just a 5 minute stroll from the station. Charlie And The Bhoys web site. Living Irish folk legend CHRISTY MOORE plays 2 nights at the Southbank Centre, Belvedere Road, London SE1 8XX. Ticket prices range from £30 to £42 available from here. Waterloo tube is only a couple of minutes away from the venue. An intimate two night residency for the Irish group LANKUM, debuting a new live show, plus special guests at the Cafe Oto in Dalston, Hackney in East London. Save money by buying tickets for both nights together. Details and ticket link here. THE REAL McKENZIES at the New Cross Inn. Bit of a bugger to get to this venue but well worth it. Venue here. Facebook event here. The Lagan was a trio from Glasgow: my friend Billy Patton and his brother and the ‘owd crooner Arther Johnson…does the new London Irish punk band called the Lagan know this? I doubt it. Is their any links to their music?